A trend is emerging in southern Zambia of preachers claiming to be able to cure HIV/AIDS and telling followers to stop taking medication to prove their faith. 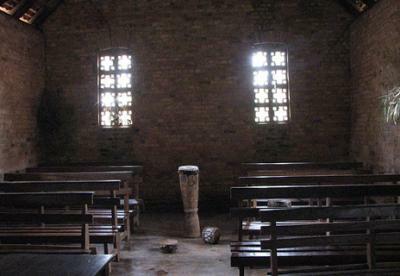 Inside a church in Zambia. Photograph by Seyemon. Over the past few years, Zambia, which has one of the heaviest HIV/AIDS burdens in world, has managed to reduce its HIV/AIDS rate and make promising progress in the areas of diagnosis, treatment and care. But while there have been some heartening national advances in combating HIV/AIDS in Zambia, a worrying trend has been developing in the southern town of Choma. Over the past year, there has been an increase in the number of people with HIV/AIDS who have stopped taking their medication there. Health workers in the area cite the growing presence of ‘prophets’ as the main reason behind this. Some preachers in the area have been claiming to be able to heal HIV/AIDS through prayer and holy water, and been urging congregants to prove their faith by abandoning their prescribed drugs. Only then will God heal them, they are told. Christianity is a huge part of many Zambians’ lives and the Christian church is a very powerful institution in the country. In recent years, Pentecostalism in particular has exploded on the continent, and with it the teaching of the so-called ‘prosperity gospel’ – also called the ‘health-and-wealth gospel’ or the ‘faith gospel’ – which claims faith and donations will be rewarded by God here on earth. The idea is that God wants to bless his followers, and that these blessings need only be ‘unlocked’ through prayer and demonstrations of faith, which often entail large monetary offerings to the church. An off-shoot of this thinking is the idea that those who pray for healing must also prove that they trust in God’s power by rejecting medical aid. Congregants are sometimes asked to go as far as to burn their medication. Many preachers also style themselves as prophets anointed by God, thus removing the possibility for criticism from their congregation; any doubt or complaint against him would, by this line of thinking, be a doubt or complaint against God himself. Furthermore, given that the literacy rate is low in the area, pastors are often the only source of Christian teaching. But for opportunists, the combination of low literacy and high potential for profit has made the church an attractive option – contributing to a trend that can be seen in a number of countries across Africa. Paul Gifford notes that Africa’s economic situation “has made of the church a road to status and professional or economic advancement”, while Reverend Timothy Njoya claims that “over 90% of the clergy in Kenya today have no call at all”. “They come to the ministry because they could not have achieved a better career [elsewhere]”, he says. Television in Africa has much to do with the growth of the prosperity gospel. ‘God-channels’ are numerous and widely watched, since they are often one of the few options available. They feature regular sermons on giving and receiving ten-fold, and the performance of healing miracles and exorcisms. The preachers on these channels – TB Joshua of Nigeria being a prominent example – are often seen as celebrities in Zambia, attracting followers because of their fame, money and influence. The desire among some clergy to emulate them is one reason for the emphasis in many churches on healing, and especially on healing AIDS, since this is considered highly impressive. So what is being done to stop this trend of HIV/AIDS sufferers stopping taking their medication? One thing health workers are doing is finding those who claim to have been healed by preachers and encouraging them to get re-tested. This has been found to work in many cases with patients, who learn they are still HIV positive, restarting their medication and stopping attending the church that claimed to have healed them. In some cases, however, re-tested sufferers insist that the machines are lying or are told by preachers that they simply did not pray hard enough or give a large enough offering to the church. Some others refuse to go for re-testing at all. But there are also many other possible ways of pushing back against the trend. In terms of enforcement, destroying ARVs (of which there are often shortages in clinics) is already illegal and can lead to imprisonment, but, according to residents, no-one in Choma has been convicted of this practice and people are reluctant to speak out against ‘men of God’. In terms of changing perceptions, more community education regarding HIV/AIDS would certainly help. Health workers providing home-based care and regularly visiting HIV/AIDS sufferers agree that lack of knowledge and understanding makes it easy for their patients to be exploited. Alongside this, more media coverage of the issue – such as the emotive and furious article in the Zambia Daily Mail last year, in which a Zambian commentator warned his compatriots of “merchants of death” in churches – could also help raise awareness. A final initiative being tried out directly incorporates religious leaders into efforts. The District AIDS Task Force has responded to the growing phenomenon by inviting church leaders to a series of group discussions about healing and the bible. Their approach is wholly educational, rather than confrontational. They refer to the story of Moses, who was instructed by God to make a snake out of bronze and put it on a pole, so that the Israelites bitten by snakes might look on it and be healed. This implies, they explain, that God can provide a remedy for sicknesses through his instructions to someone in authority like a doctor, and HIV/AIDS sufferers are encouraged to pray to God but to pray to be healed through ARVs, doctors, and health workers. Whether with crossed fingers or bowed heads, many hope such initiatives will help change perceptions and push back against the trend of sufferers stopping taking their life-saving medication.